Analysis: Why is Iran so upset with Britain? Robin Oakley: Singling-out of UK leaves Iran room for maneuver with U.S.
LONDON, England (CNN) -- The contested election results in Iran have brought thousands onto the streets of Tehran in protest. So why have the voices of two of Iran's most prominent critics -- the United States and its leading ally the UK -- so far been comparatively muted in their support of the protesters and in their criticisms of the regime? 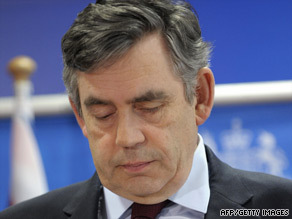 Gordon Brown's comments on Iran have been muted despite sharp attacks on the UK. And why is Britain being singled out as a target for the ire of the Iranian authorities? U.S. President Barack Obama has said that he has "deep concerns" about the election but that he does not want to be seen meddling in Iran's affairs or picking sides between President Mahmoud Ahmadinejad and his rival Mir Hossein Moussavi. UK Prime Minister Gordon Brown has said that questions about the validity of the polls "need to be answered" and that the way Iran responds to "legitimate protests" will affect its relationships with the rest of the world. But he too has kept his hand off the diplomatic throttle. There has been widespread criticism of the Tehran regime. Germany's Chancellor Angela Merkel has called for the election votes to be recounted and French President Nicolas Sarkozy has branded the elections a fraud, insisting that "when we have to condemn, we condemn?" At the weekend the heads of 27 European Union countries combined in a statement which called for all Iranians to be granted the right to assemble and express themselves peacefully. Mottaki went on to complain to foreign diplomats that "Great Britain has plotted against the presidential election for more than two years. We witnessed an influx of people (from Britain) before the election. Elements linked to the British secret service were flying in in droves". Now Iranian parliamentary speaker Ali Larijani has called for a revision in the state of diplomatic relations with Britain. So what is going on? After all, Obama is having to ride tough criticism from Republicans like John McCain who are accusing him of abandoning fundamental principles in a "tepid" response. The Iranian elections are an easy target and Brown, holed below the waterline in opinion polls, needs every jot of public approval he can get. One answer is that Western leaders feel that their tactics have already proven a success. The Iranian leadership is patently struggling to cope with Obama's readiness to resume a dialogue. It is far easier for them to contain domestic dissent over a poorly performing economy and restricted personal freedoms when they can frighten their citizens by invoking a malevolent threat from outside. A U.S. President holding out his hand and offering a new relationship is much harder to present convincingly as "the Great Satan." A regime whose Guardian Council has already had to change its stance over how much may have gone wrong with the elections is not one which can plausibly insist on running the country's affairs on the basis of absolute divine guidance as interpreted by religious chiefs .The political ground is shifting. Against that background it is almost certain that obvious interference by outside powers would be counter-productive. It would enable the existing regime to present protesters and those who contact the outside news media as traitors and pawns of international interests. Secondly, Western leaders like Obama and Brown have a continuing interest in a game which could have a much more profound influence on regional and world peace than the current round of protests against a regime whose legitimacy has now been called into question by a significant section of the Iranian population. The UK, France and Germany (negotiating on behalf of the European Union) plus Russia and the U.S. have long been involved in efforts to restrain Iran's uranium enrichment program, which they fear is aimed at supplying Tehran with nuclear weapons. Political calculations over that issue, even if not acknowledged openly at this time, come into the equation. Using tougher language about the repression of street protests might make for a more comfortable political life at home for Obama and Brown but it would not necessarily be in the long term interests of cracking the nuclear problem. The Western leaders will have noted too that Mir Hossein Moussavi also insists on Iran's right to maintain its nuclear technology program and says that the consequences of giving it up would be "irreparable." As for the way in which Tehran is currently fixing on Britain as the target for its ire, that is seen in a perverse way as an encouragement. It is an obvious indication that the leaders in Tehran are divided on how to respond to President Obama's offer of a new relationship and that they have not ruled out a more positive response than they have offered so far. Blaming the 'little Satan' of Britain for what it alleges to be outside meddling rather than the 'Great Satan' of the U.S. gives the Iranians an outside threat to point to without turning the much-questioned election results into a full propaganda war with the new man in the White House. The question is how effective that tactic will be. Will the historic memories of previous British interference, such as the ousting of Prime Minister Mohammed Mossadeq in 1953, still linger in a population in which 60 percent are under the age of 30, many of them capable of filming any street brutality on mobile phones and seeing for themselves who is orchestrating it? All About Ayatollah Ali Khamenei • Mahmoud Ahmadinejad • Iran • Facebook Inc.